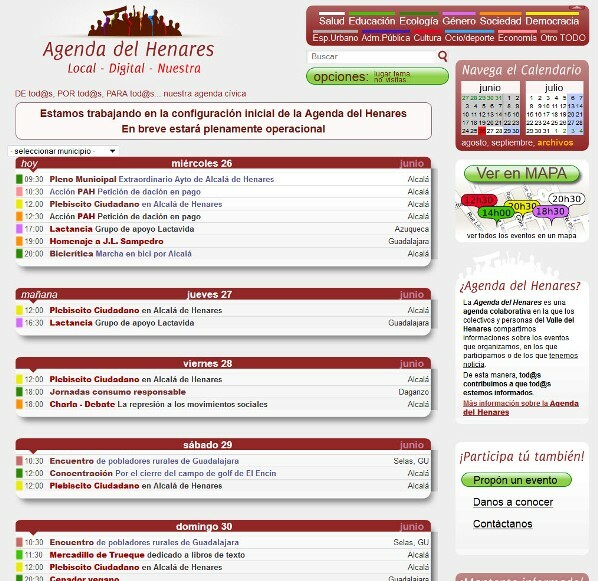 We are creating the “Agenda del Henares” together with the social movements of the Henares Valley. It is a collaborative agenda that allows groups and individuals to share information about the events they organize, take part in or get to know about. Click on the image below to visit the Agenda del Henares and… get informed!! The calendar uses the free software “Démosphère” and provides one of the ‘connective pillars’ which, according to our research, is essential to create “sensible cities”. In upcoming posts we will write more about the Agenda and all the things we will learn by creating it with the good people of the Henares Valley.